To Cite: Kaykhaei M A, Shahraki M R, Mohammadi M, Moshtaghian B, Zandkarimi M. The Effects of Topical Application of Thyroid Hormone (Liothyronine, T3) on Skin Wounds in Diabetic Wistar Rats, Zahedan J Res Med Sci. 2016 ; 18(4):e6449. doi: 10.17795/zjrms-6449. Background: Efficient treatment of skin ulcers, a leading cause of substantial number of morbidities among diabetic patients, is a subject of matter. Objectives: Since current therapies are partially effective and/or expensive and topical liothyronine (T3) was shown to get faster wound healing in mice, the present study was designed to assess its effectiveness in diabetic male rats. Materials and Methods: In this experimental study, 30 male wistar rats with mean weight of 242 g were randomly assigned into control (group C) (n = 10) and diabetic (n = 20) groups. Diabetes was induced by intraperitoneal (i.p.) injection of streptozotocin. Diabetic rats were randomly subdivided into two groups: diabetic T3 group (group A) which was treated with 150 ng/day topical T3 and diabetic placebo group (group B) received vehicle. Full thickness wound on dorsum was created in each rat (1 cm2). Photographs were taken at baseline, fourth and tenth day to analyze changes in surface areas of wounds. Results: Results obtained from the present study showed that baseline surface areas of wounds were similar in all groups. Conversely, wound contraction was significantly better in T3 group in fourth and tenth days compared to placebo group, (P = 0.001, P < 0.00001). Moreover, wound healing was impaired in diabetic placebo group compared to other groups (all P < 0.05). Conclusions: This study revealed that topical T3 administration is an effective measure for treatment of ulcers in diabetic male rats. Diabetes mellitus is the most important endocrine disorder rising health problem in most countries . It is a significant cause of expanded illnesses and early-on death [1, 2]. The common prevalence of diabetes among the American is 8% and is expected to get to 9.8% by the year 2035 . The prevalence is expected to increase in the coming years and this will be accompanied by a raise in the prevalence of its complications, as well as diabetic foot ulcers . Diabetes mellitus, the most prevalent metabolic disorder, may initiate numerous chronic complications accompanied by serious disabilities [5, 6]. Diabetic ulcer, the leading cause of lower extremity amputations, is a common relapsing and often disabling complication of diabetes mellitus [7, 8]. Most of current therapeutic options for diabetic ulcers are cumbersome and or expensive [9-11]. In this regard, a noticeable number of studies focused on topical therapy for diabetic ulcers [12-14]. Thyroid gland cells produce T4 and T3 hormones in which predominant circulating thyroid hormone is, T4 (thyroxine). T4 is converted by intracellular thyroid hormone deiodinases to T3, the active thyroid hormone, T3 [15, 16]. Apikoglu-Rabus et al. revealed that liothyronine (T3), the active thyroid hormone, accelerate wound healing in mice  and it is probably through proliferation of keratinocytes [18-21]. However, to date, no information about effects of thyroid hormones on diabetic wounds is available. The aim of the present study was to investigate whether topical T3 speeds up wound healing in diabetic rats or not. This experimental study was performed on 30 male Wistar rats (center for laboratory animals, Zahedan University of Medical Sciences) weighing 210 - 300 g. The animals were kept in balanced 25ºC temperature with 12 h light and dark cycles and were fed with standard pellets ad libitum. Individual cages were used for housing after wound creation. Animals were randomly assigned to diabetic and control groups. In twenty rats, diabetes was induced by intraperitoneal (i.p.) injection of streptozotocin (STZ) as described later (diabetic group). Remaining 10 rats, given the same amount of saline intraperitoneally, were labeled as control group (Group C). The rats in diabetic group were randomly subdivided into diabetic T3 group (Group A) (n = 10), which have been treated with 150 ng/day topical T3 and diabetic placebo group (Group B) (n = 10) which have been treated with vehicle (polyethylene glycol). Twenty rats in diabetic group were given a single i.p. injection of 60 mg/kg STZ (Sigma-Aldrich, Germany) dissolved in sterile citrate buffer (sodium citrate, pH = 4.5). The rats were monitored for polyuria, polydipsia, polyphsia and weight loss. Diabetes was confirmed by measurement of fasting blood glucose, obtained from tail, using a glucometer (Accu- Chek; Roche Diagnostics, Germany) 72 hours after STZ injection. Rats with blood glucose higher than 15.5 mmol/L (280 mg/dL) were considered to be diabetic. After a week of diabetes induction, both rats in control and diabetes groups were anesthetized with 10% solution of chloral hydrate in saline then the dorsal hair of the rats was shaved. After disinfecting, under sterile conditions, a round full thickness wound, approximately 1 cm2 surface area was created using a fine scissor. The wounding day was labeled as 1st day. The wounds were kept open throughout the study and were daily inspected. Photographs were taken in certain days including 1st (baseline), 4th and 10th by a digital 12.1 megapixel camera (Canon, Tokyo, Japan) and surface areas of wounds at various times were calculated using a standard software in scientific image analysis (Image J version 1.46 r, Wayne Rasband, National Institute of Health, USA). Topical T3 was prepared by admixing pure T3 (Iran Hormone Pharmaceutical Company, Tehran, Iran) into a polyethylene glycol based vehicle (Fluka, Sigma-Aldrich, Germany) to produce topical ointment. Multiple adjustments were carried out to ensure delivery of 150 ng of T3 in a single appliance. Data were expressed as Mean ± SD. One way ANOVA was used for comparison between groups, complemented with Bonferroni correction. P < 0.05 was set to be significant. Statistical analyses were performed using SPSS-19 software (SPSS Inc., Chicago, IL, USA). The study protocol was approved by ethical committee of Zahedan University of Medical Sciences and principles for the use of laboratory animals according to national research council committee for the update of the guide for the care and use of laboratory animals  were applied. Thirty male Wistar rats randomly assigned to three groups were included in this study. All twenty rats were given STZ developed diabetes after 72 hours. As shown in Table 1, there were no differences between groups regarding weight and baseline surface areas of wounds. However, mean blood glucose was significantly higher in groups A and B versus group C (P < 0.00001). At the end of fourth day of intervention, there was significant reduction in wound surface area in T3 treated in diabetic group versus diabetic placebo group (P = 0.001) being comparable to non-diabetic group. 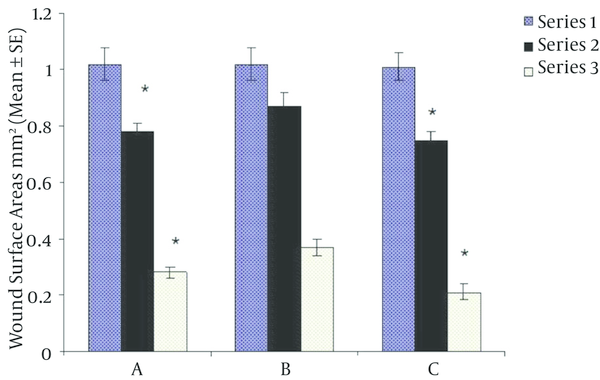 Ten days after initiation of study, wound surface area decreased more in T3 treated group than in diabetic placebo group (Figure 1, P < 0.00001). Furthermore, wound healing was significantly impaired in diabetic placebo group compared to T3 treate. P < 0.05; Mean ± SD. Based on One way ANOVA and Bonferroni statistical testes at first, body weight and wound surface area among all groups did not show any differences but blood glucose in diabetics groups (A and B) was significantly higher than control group (C). Results were expressed as Mean ± SD, P < 0.00001. Our results revealed that there is not only a significant delay in wound healing in diabetic rats but also a considerable improvement by topical administration of T3. To the best of our knowledge, this is the first study to investigate effects of topical T3 in wound healing in diabetic rats. Although the main action of thyroid hormones in skin is not well identified, several lines of evidence indicate an important role for thyroid hormones in promotion of wound healing. First, hypothyroidism is associated with retarded wound repair probably through decreasing collagen synthesis and or keratinocyte proliferation [21, 23, 24] which is reversible with thyroid hormone replacement [21, 25]. Second, in vitro and in vivo studies have designated that thyroid hormones stimulate keratinocyte and epidermal proliferation as well as hair growth [20, 21, 26]. Finally, it has been shown that daily treatment with 150 ng topical T3 in mice improves wound closure significantly . In the latter, the sole experimental study, Safer et al. demonstrated acceleration of wound closure in mice treated with either 150 ng or 3.8 µg topical T3 daily; however, no further improvement was observed in those who received more than 150 ng/day. Although there was some systemic absorption of T3, manifested as lower serum T4 levels in 3.8 µg/day group, this was not significant in 150 ng/day group. As multiple mechanisms are involved in the development of diabetic ulcers comprising poor tissue perfusion , trauma and infection , it is not surprising that thyroid hormones promote ulcer healing. Apart from stimulation of keratinocytes proliferation [21, 26], T3 may exert positive effects on wound healing by increasing the circulation to the site of injury through vasodilation [29, 30]. Another interesting contributing mechanism may be the potential antiseptic action of thyroid hormones [31, 32]. Although we did not assess possible side effects of topical T3, the potential weak point of study, Safer et al.’s , experiment signified negligible systemic absorption of drug especially in 150 ng/day group. Both low systemic absorption and ineffectiveness of intraperitoneal T3 in Safer et al.’s study  are explained by lack of direct blood supply of epidermis and relatively high content of selenodeiodinase type 3 (D3) in cutaneous tissue . Compared to other available modalities for treatment of diabetic wounds, topical T3 can easily prepared with low cost and more physiologic than several current therapies [10, 11, 13, 18]. Topical liothyronine is an effective, inexpensive and probably safe therapeutic option for diabetic ulcers. Further larger studies focused on potential adverse effects of topical T3 and quality of scar are suggested. This work was performed by Mahmoud Ali Kaykhaei and supported financially by Zahedan University of Medical Sciences, deputy of research dissertation grant for thesis of BM. We greatly appreciate cooperation of iran hormone pharmaceutical company in this project for providing liothyronine free of charge. Authors’ Contribution: Mahmoud Ali Kaykhaei carried out the design, coordinated the study and prepared the manuscript. Mohammad Reza Shahraki provide assistance in the design of the study, coordinated and carried out all the experiments. Mahdi Mohammadi provided assistance in the design of study and carried out all of statistical analyses. Bahador Moshtaghian provided assistance in preparation of topical T3 and experiments. Majid Zandkarimi carried out preparation of topical T3 and provided assistance in experiments. All authors have read and approved the content of the manuscript. Funding/Support: This work was supported financially by Zahedan University of Medical Sciences, deputy of research dissertation.